While vegetable gardening itself is a fairly easy, enjoyable activity, creating the initial garden takes some work. It’s worth it though, and luckily it only needs to be done once. Be sure to put some thought into your vision for your vegetable garden before you start digging. 1. 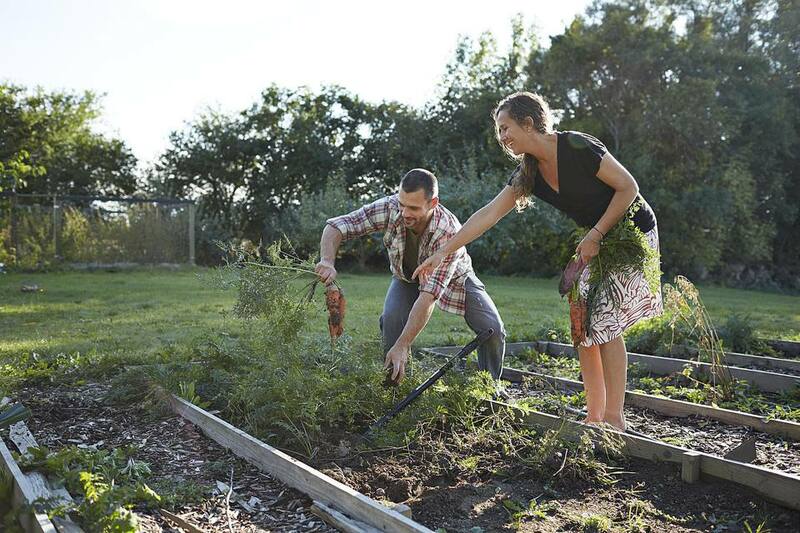 Size - How Large Should Your Vegetable Garden Be? My first recommendation is to start small. Unless you have your heart set on space hogs, like corn, start with a manageable sized garden. 12 X 20 should give you plenty of variety. Vegetables won’t wait for when it’s convenient for you to get to them. Measure and mark out your garden space on the lawn. Now comes the really hard work of making a new garden. Do you remove the sod or build on top of it? This is no one's favorite garden chore, but there's no way around it. Your chosen site will probably have grass on it or at least weeds. These must be cleared somehow before you can plant anything. Tilling without removing the grass or weeds is best done in the fall so that the grass will have a chance to begin decomposing during the winter. Even so, you will probably see new grass and weeds emerging in the spring. It's better to either remove the existing vegetation completely or to smother it. A sharp flat-edged spade can be used to slice out the sod. If you have poor soil and need to amend it with organic matter or other nutrients, removing the sod may be your best bet, so that you can till in the amendments. There are alternatives to digging. Removing sod can be heavy work, and you wind up losing good topsoil along with the sod. If your soil is in relatively good shape, it is possible to leave the grass in place and build on top of it. Place a thick layer (8-10 sheets) of newspaper over the garden bed and wet it thoroughly. Then cover the newspaper with 4-6 inches of good soil. The newspaper will eventually decompose, and the turf and weeds will be smothered. There may be some defiant weeds that poke through, but not so many you can hand weed them. There’s more about this layering method of creating a garden in this new garden step-by-step. Starting with good soil means you won't have to add a lot of artificial fertilizer to your garden. If you've fed the soil with amendments, the soil will feed your plants. How you develop the actual layout of plants (rows, wide rows, four-square, eclectic..) is entirely a matter of preference. Each style has its advantages and drawbacks. RowsPros: Planting in neat, tidy rows allows for good air circulation, easy weeding, and easy harvesting. Cons: Single rows of plants can take up more space than wide rows. Floppy plants, like peas, will need to be trellised. Wide RowsWide rows are when you plant long blocks of the same vegetable. Wide rows shouldn’t be so wide that you can’t comfortably reach into the center of them, from either side. Four foot wide rows are good for most people. Pros: Wide rows let you cram more plants into less space. Without the spacing and paths in between, you can get up to 6 times more vegetables in a wide row than in a conventional single row. Wide rows act as their own mulch. They shade out weeds, keep the soil most and require less watering. Cons: Not all crops lend themselves to wide rows. Tall, long-growing crops, like tomatoes and eggplant, yield better if not crowded. In areas with high humidity and the attendant problems, crowding plants into dense rows can exacerbate those problems. Four-SquareThe Pennsylvania Germans are credited with coming up with this garden layout, and it’s regaining in popularity. Four-square refers to the garden being divided into four equal parts with narrow paths in between. The beds themselves were usually raised slightly. Although we know them best as four-square, they can be divided into any number, to make the garden easier to maintain. Dividing the garden into compartments is handy when it comes time to rotate your crops. If you choose to grow perennial crops, like asparagus and rhubarb, you can devote a bed to them, where they won’t be disturbed when you cultivate. The soil in raised beds drains better than level soil, and it warms faster in the spring. Cons: Four-square gardens are semi-permanent structure, so if you plan to move or enlarge your garden, they’ll be more work. Some people just don’t like the formal symmetry of a four-square garden. EclecticEclectic takes in a wide range of styles. But what I’m mostly referring to here is the free-form companion planting style that more resembles a cottage garden than a vegetable garden, with a pepper plant here there and where ever. Pros: This style can be very ornamental, and you’d be surprised how much you can fit in a garden with no order. You’ll attract more pollinators, and beneficial insects with the variety and flowers and pest insects may not notice their favorite crops interplanted with others. Cons: Eclectic gardens can be difficult to maintain. Without definite paths, it’s hard to know what is a weed, let alone remove weeds. It’s also difficult to harvest. Since you’ll be hauling compost, manure, and other amendments into your vegetable garden on a regular basis, having paths that are easily navigable is a big plus. I recommend making paths wide enough for your wheelbarrow or cart to get through. It may seem like a sacrifice of good growing space, but you’ll be glad for the functionality when you’re bringing things in and out and when it’s time to harvest.